The kitchen is the busiest room in your house, and the place families and guests tend to congregate. So how do you balance the food preparation and the socializing without crowding? Add an island! 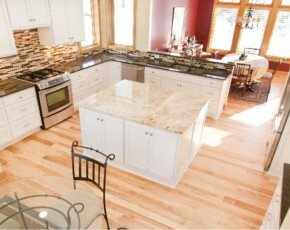 An island is the most versatile element of your kitchen layout. It can be a primary or secondary part of your work triangle, serving as a cooking area, with a range top, oven, pot and pan storage and racks for baking sheets, or a prep/cleaning area, with a double sink, dishwasher, integrated cutting board, and tilt-out trash can. 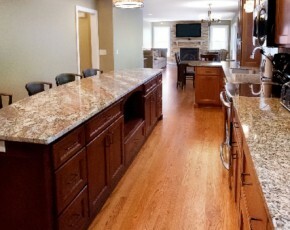 An island can even be a food storage area, with refrigerator/freezer drawers, wine cabinets, and veggie baskets. Some people use their island as overflow storage, hiding away small appliances or seasonal dishware. Some use their island as display centers, with shelves holding a cookbook collection or sentimental items. Many people use their island to supplement (or replace) dining area seating. By far, the most popular use of an island is to combine kitchen functionality on one side with informal seating on the other. If you use your island as a seating area, the two most important things to consider are seating height and legroom. If your island is all at standard cabinet height (36”), regular dining chairs should be used. Having multiple heights on your island is a very popular choice, with the dining area being raised between 6” and 12” above the work area. In these cases, bar stools or stadium stools should be used. 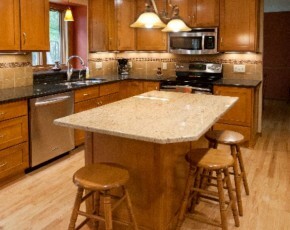 On the kitchen side, that raised area can accommodate extra cabinets, additional power outlets, or shelving. Having a raised bar on the island also blocks sight lines into the work area of the kitchen, hiding the messy prep work and dirty dishes. Whether your island is 36”, 42” or 48”, you will need an overhang for your visitors to be able to sit comfortably, without banging their knees on the back of the island. A 12” overhang is the minimum recommended distance. 18” is far more comfortable for raised bars, while 24” allows diners to scoot up right to the edge, as with a table. The construction of the island is another important consideration. Will it match the rest of the cabinetry to present an integrated look, or will it be a showpiece, built out of contrasting materials or in a different style? 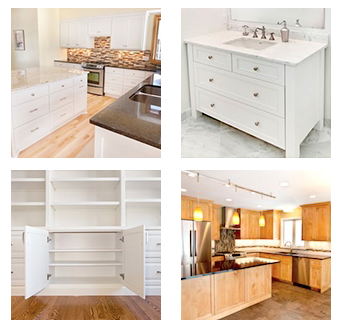 Hiring a custom cabinet maker such as the Artisan Cabinet Company in Chaska, Minnesota will give you many more options when it comes to your island. As the kitchen continues to be the central gathering point for friends and families, your island will be the focal point of all of the activity. Your custom cabinet maker will work with you to design and build a functional, beautiful centerpiece.